36196 gestempelt (marked) Briefstück (on piece) ungebraucht (hinged) * ungebraucht ohne Gummi (unused without gum) (*) 1856/1858, PEDRO V. "curly hair" (Mi. 9/11, CE #10/13), very comprehensive lot with more than 400 stamps, predominantly used with different types, colors and shades, multiples, neat cancellations and further specialities, many stamps in F/VF condition. High catalog value! 36197 gestempelt (marked) Briefstück (on piece) 1856/1858, PEDRO V., 25 blue (Mi.10, CE #12), lot with more than 50 used stamps, comprising various colors, shades, types, postmarks etc., mostly F/VF condition. 36205 ungebraucht (hinged) * 12 (8) 1862, Luis I. 5 r. brown, small lot of six copies and two reprints mint hinged, different types, most of them with a beautiful wide margin. (Mundifil 14). Scarce offer! 36206 gestempelt (marked) 13 (100) 1862, Luis I. 10 r. orange, lot of at least 100 used copies , many with a good margin, different types, interesting cancellations, mostly numerals. (Mundifil 15). 36207 gestempelt (marked) Briefstück (on piece) 13 (100) 1862, Luis I. 10 r. pink, lot of more than 100 used copies, many with a good margin, different types, interesting cancellations, mostly numerals. (Mundifil 16). 36208 ungebraucht ohne Gummi (unused without gum) (*) ungebraucht (hinged) * 15 (6) 1862, Luis I. 50 r.green, lot of four unused copies of this rare stamp and two reprints, mostly with no gum. One piece with stain spots, one with a mall hole. (Mundifil 17). 36209 gestempelt (marked) 15 (25) 1862, Luis I. 50 r.green, lot of 25 used copies with interesting shades and types in varying condition. (Mundifil 17). 36210 ungebraucht (hinged) * ungebraucht ohne Gummi (unused without gum) (*) 16 (5) 1862, Luis I. 100 r. purple, small lot of three unused copies of this rare stamps and two reprints u unused copies of this rare stamp and two reprints, mostly with gum in varying condition. (Mundifil 18). 36211 gestempelt (marked) 16 (56) 1862, Luis I. 100 r. purple, lot of 56 used copies, some with very wide margins, also interestings shades and cancellations, mainly numerals. (Mundifil 18). 36212 gestempelt (marked) 12 (135) 1862, Luis I. 5 r. brown, lot of ca. 135 used copies , many with a good margin, different types, interesting cancellations, mostly numerals. (Mundifil 14). 36213 gestempelt (marked) 12 (150) 1862, Luis I. 5 r. brown, lot of ca. 150 used copies , many with a good margin, different types, interesting cancelations, mostly numerals. (Mundifil 14). 36214 gestempelt (marked) 1862/1864, LUIS I., 10 reis orange (Mi.13, CE #15), lot with 18 used stamps, comprising various shades and postmarks, many stamps in F/VF condition. 36215 gestempelt (marked) Briefstück (on piece) 1862/1864, LUIS I., 25 reis carmine/rose (Mi.16, CE #16), lot with ca.250 used stamps, comprising various colors, shades, types, postmarks etc., mostly F/VF condition. 36216 gestempelt (marked) Briefstück (on piece) 1862/1864, LUIS I., 25 reis carmine/rose (Mi.16, CE #16), lot with more than 180 used stamps, comprising different colors, shades, types, varieties, margin pieces, postmarks etc., mostly F/VFcondition. 36217 gestempelt (marked) Briefstück (on piece) 1862/1864, LUIS I., 5 R to 100 R (Mi.12/16, CE #14/18), very comprehensive lot with more than 800 used stamps, comprising all values in different types and shades, various postmarks including rare cancellations and further interesting items, many stamps in F/VF condition. Great choice for the specialized collector. Very high catalog value! 36218 gestempelt (marked) 1862/1864, LUIS I., 5 reis brown (Mi.12 I/II, CE #14), comprehensive lot with ca. 150 used stamps, comprising various types, colors and shades, postmarks etc., mostly F/VF condition. 36219 gestempelt (marked) 1866/1867, LUIS I., "fita curva", 5 reis - 120 reis imperforated and 5 reis - 240 reis perforated (Mi. 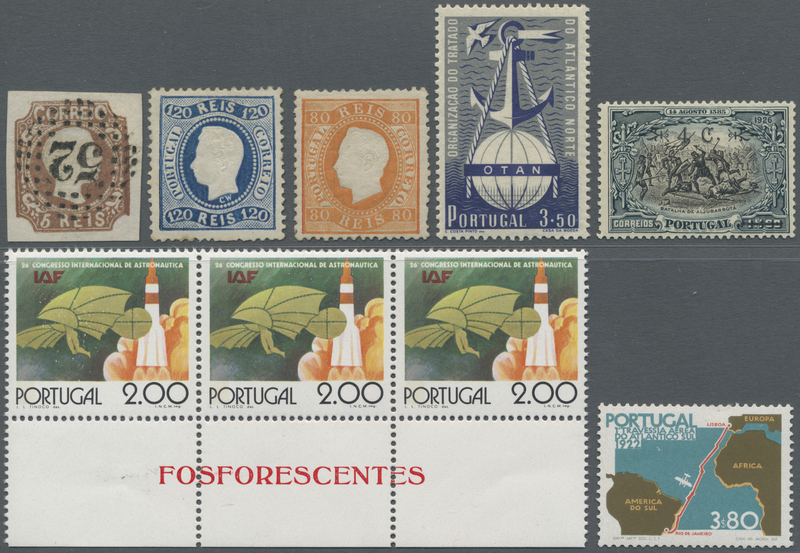 ex 17/33, CE #19/35), lot with ca.350 used stamps, comprising various colors, shades, postmarks etc., many F/VF condition. Very high catalog value! 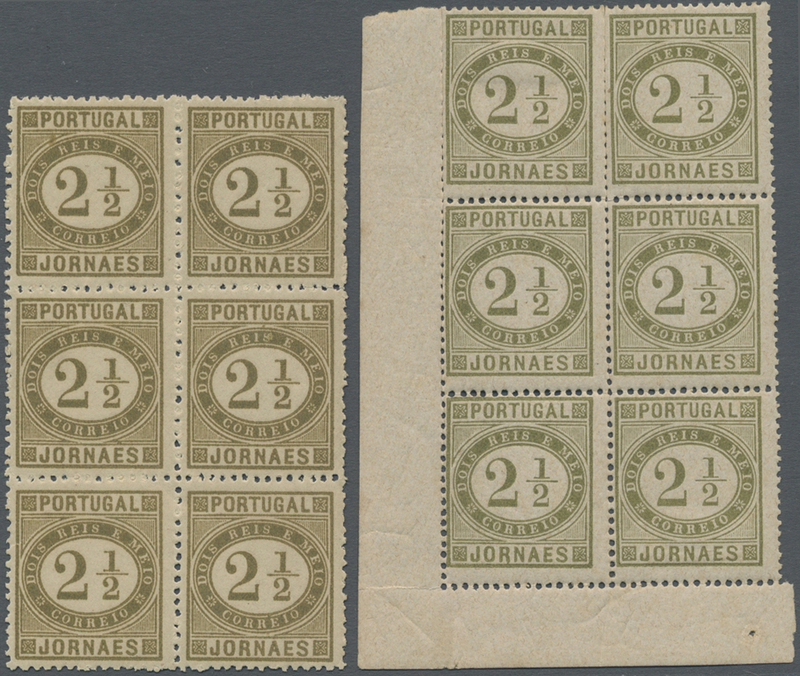 36222 gestempelt (marked) ungebraucht (hinged) * 1866/1867, nice lot of a scarce set of Portugal #19 to #26, postmarks, shades, for study, with some mint stamps. High catalog value.